TRIVIUM will continue their wildly successful The Sin and The Sentence World Tour with another leg of North American dates this fall. The band will hit the road on a headline run this October. The bill will feature very special guest AVATAR and LIGHT THE TORCH. The 25-date trek kicks off on October 3 in Tampa, Florida and runs through November 3 in Berkeley, California, with several stops in Canada. 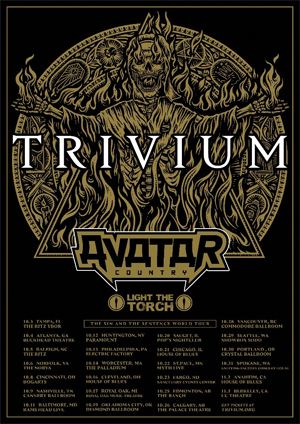 All TRIVIUM tour dates are below, including their summer 2018 U.S. tour dates and festival appearances. VIP packages are on slae now and the public on-sale is set for Friday, June 8 at 10 a.m. local time. "North America! The last North American and European runs were the greatest TRIVIUM tours we had ever experienced," the band said. "Now how do we top it? We follow up with more songs from our extensive eight-record catalogue, a massive production and setlist, and two more of our favorite bands on earth: AVATAR and LIGHT THE TORCH. See you all soon." TRIVIUM recently released the video for "Endless Night" from their album THE SIN AND THE SENTENCE, out now via Roadrunner Records. Watch the performance-driven and visually-charged video, which was shot in Orlando by director John Deeb and produced by Deeb Studios, on KNAC.COM HERE. Recorded with producer Josh Wilbur (LAMB OF GOD, GOJIRA) at Santa Ana, California's Hybrid Studios, THE SIN AND THE SENTENCE finds TRIVIUM – Matt Heafy (lead vocals, lead guitar), Corey Beaulieu (guitar, vocals), Paolo Gregoletto (bass) and Alex Bent (drums) – returning with their first new music since their celebrated 2015 LP, SILENCE IN THE SNOW. The new LP also features the band's first recordings with new drummer Bent who joined the band last year.